Data Storage • Innovative Network Computer Solutions, Inc. These days there are so many ways to store your data, your systems, your … everything. Private Cloud, Public Cloud, SAN, NAS, direct attached storage, SCSI, iSCSI, fiber channel, SATA, SAS, RAID, tiered storage… so many technologies and so little time. What do you really need to know about where and how your data is stored? It’s simple, we know. At INCS, we’ve made life so easy for so many clients, we can recite that wish list in your head before you ever open your mouth to speak. Here, how’s this for reading your mind on data storage? 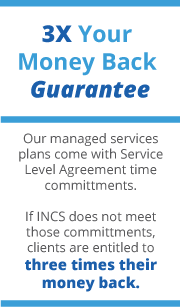 We at INCS get it. We’ve reconfigured and managed data storage from a few workstations in a single office to a data centers to cloud solutions. A lot of these choices depend on the type and size of your company and, quite simply, how your people work. We then factor in variables such as security, business continuity and operational efficiency to create the best solution for your business.